Yesterday evening I attended a local Brexit information meeting set up by the British Embassy, facilitated by Kathryn Dobson who produces the Living Magazine and felt strongly that events like this don’t just take place in big cities like Paris, Lyon and Nice. Matthew Lodge, the Embassy number two, along with a small team from consular services came to Civray, a rural town in the Vienne region, close to the Deux-Sèvres and Charente borders, an area in France where there are a lot of British residents. It was informative and I’m glad I was there, even if all our questions don’t have answers just yet. Firstly I was impressed by the turn out, the theatre was almost full, and our presence reinforced our interest in knowledge about the changes ahead and helped put across our worries and fears for our future. Matthew Lodge was engaging, pleasant and tried to be reassuring without fobbing us off, but he was also clear that following the referendum there is now an all-party determination to respect the result and to make the best of it. Brexit is happening and it will bring about change to everyone, especially those of us living in the EU. There were some angry and upset people, but the questions that were put to Matthew were generally well thought out and answered clearly and to the best of his knowledge. One of the questions was from a local French Maire, who spoke excellent English, and had taken the time to come along in order to be better informed to help her British residents. She was seeking ways to reassure them that they still had a future to look forward to in France, a similar reassurance that I was looking for too. This is not a detailed synopsis from the meeting, but the points I found worth noting. The term ‘settled status’ was used quite a lot during the meeting and my understanding of this is that it applies to those of us who by the date of the UK’s exit from the EU are considered settled and resident in France ie our primary residence is here, we are in the ‘system’, we hold a Carte Vitale health card and French driving licence, we are either working here or at least submitting tax returns here (note - the current double taxation treaty between the UK and France should not be subject to change). There is currently no requirement for UK citizens to apply for a Carte de Séjour (French residency permit), but we can do so if we wish. Matthew felt it could do those of us who are eligible no harm to apply as it will give us proof of 'settled status' and demonstrate how long we’ve been here should we need it in the future. He also advised the Embassy would be willing to intervene if our local Prefectures were reluctant to process our applications. He saw no need for us to apply for French citizenship, but understood that many might feel this was the way forward for them, especially our children who have grown up in France, as this will ensure their freedom of movement throughout the EU in the future. We are lucky that neither the French nor British governments have an issue with citizens holding dual nationality. The rights that those with ‘settled status’ are entitled to, in terms of healthcare, pensions, and right to reside are likely to remain the same following the UK’s exit from the EU. 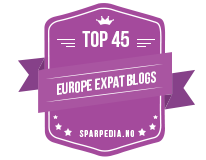 This includes the right to continue to hold an EHIC (European Health Insurance Card) medical assistance card for travel within the EU. However, for those of us with family members regularly visiting from the UK, there is no current provision for them to retain their EHIC status. I am also unclear as to what our right to receive emergency medical assistance in the UK will be. UK residents moving to France after 29/3/19 will not have these same rights that we will have. If you are reading this and fancy giving the EU life a go, do it now to ensure you are settled before March 2019. Matthew didn’t quite go so far as to tell us to learn French, but did point out that those applying for citizenship in the UK are expected to speak English. We are likely to find ourselves doing a lot more form filing in the future, so having more than a basic level of French is certainly going to help. I still have questions concerning our rights to remain elected officials on local councils here in France, something the French were keen for us to do at the last elections in 2012, and I feel strongly that to lose our voice locally would be a shame. The next phase of talks will deal with trade issues, so answers to my many questions about running a business that crosses EU borders also can’t be given just yet. The Embassy are keen for those of us in France to follow them on social media (Twitter: UKinFrance and BritishinFrance and Facebook) to ensure we are kept as up to date as possible and are happy to receive questions concerning Brexit by email. Please email france.enquiries@fco.gov.uk putting ‘Brexit query’ in the subject line. 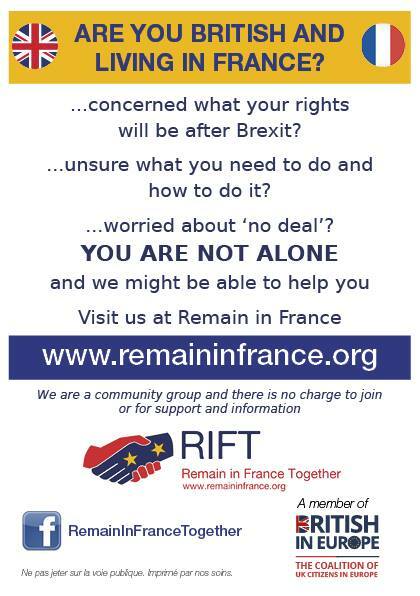 You can also contact them via their website here and sign up for Voisins Voices here, a newsletter for the British community living in France. The joint technical note on the comparison of EU-UK positions on citizens’ rights, something Matthew referred to last night, can be read in full here. Information on requesting French carte de séjour can be found here and for applying for naturalisation see here. It was suggested the Embassy put together a guide to help us in applying for French naturalisation and carte de séjour, which they seemed keen to do. If you were not at the meeting, I hope you find this helpful. You can also watch a short local news clip about the meeting in Civray, including interviews with local residents and Matthew Lodge, here. You might also like to follow British in Europe to keep up to date on their work to ensure our continued rights following Brexit. You can find their website here and follow them on Twitter and Facebook.